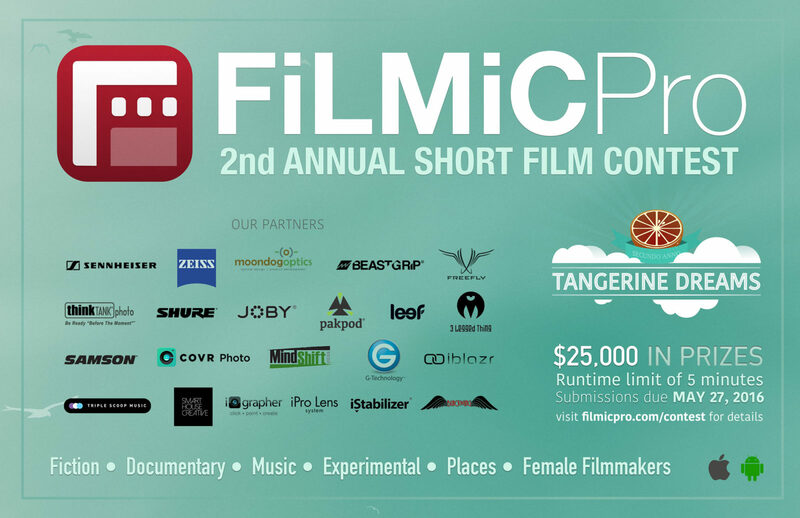 The 2nd Annual FiLMiC Pro “Tangerine Dreams” Short Film Contest is here! It’s time to get started with your next mobile film project. To enter the contest you need to shoot a short video (5 minutes or less) with your iOS or Android device using FiLMiC Pro. At least 70% of your footage needs to be shot using FiLMiC. This contest is named “Tangerine Dreams” in honor of Sean Baker’s full length feature film shot with FiLMiC Pro. Tangerine, distributed by Magnolia Pictures was nominated for Best Picture and Best Director at this year’s IFP Film Independent Awards. All submissions are due by May 27th, 2016. There will be 6 categories including Fiction, Documentary, Music, Places, Experimental and a special Jury Prize honoring female filmmakers. For more information on our categories check out this blog post. There will be a Grand Prize winner selected from the 6 finalists. We have incredible prizes again this year from Think Tank Photo, Mindshift, 3 Legged Thing, Sennheiser, G-Technology, Zeiss, Exolens, Shure, Beastgrip, SmartHouse Creative, iOgrapher, iBlazer, Fotosafari, iStabilizer, Pakpod, Triple Scoop Music, Covr Lens, Moondog Labs and more! Please check out the CONTEST PAGE for all the details and of course the rules, in order to qualify. Follow us on twitter @FiLMiCPro for updates. Tagged filmic pro contest, filmmaking contest, iPhone Contest, iPhone movie, Iphone video app, iphone video prizes, Short Film Contest, Tangerine, Video Contest.